Esra is a Saudi artist based in London, currently a PhD candidate studying interior architecture, researching Islamic patterns and their significance in design. She is the founder of the educational platform: Islamic Illumination. Over the past four years, she has studied Persian and Turkish illumination with various artists, in addition to completing a series of intensive courses with the Art of Islamic Pattern and The Prince’s Foundation: School of Traditional Arts. She is learning the traditional methods, but experimenting with different styles and compositions to find her own voice within this beautiful art. 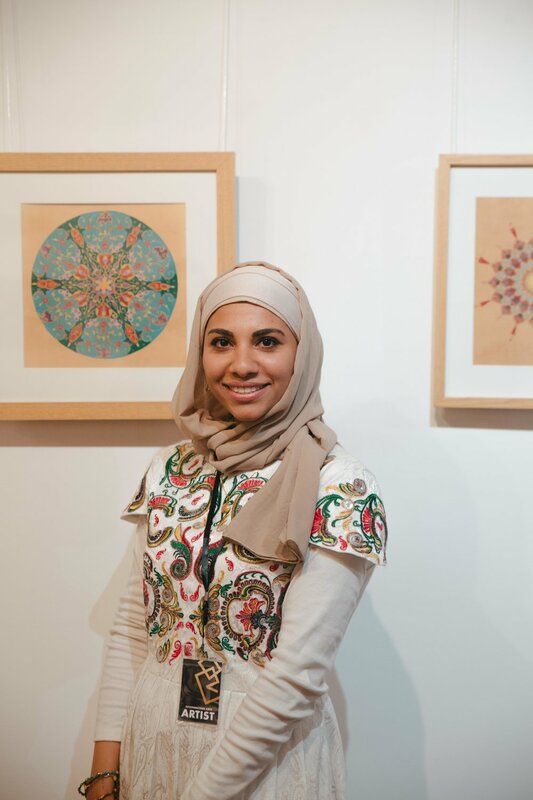 In addition to her artwork, Esra is a popular art and travel blogger, creating content to share her journey into the world of Islamic pattern to help inspire others to do the same. 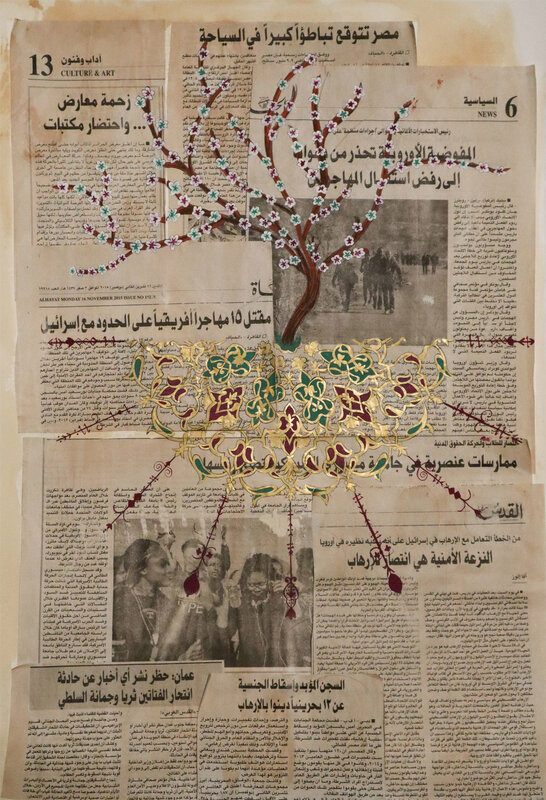 Esra’s work has been exhibited in Saudi Arabia, Oman and Bahrain as part of the Loud Art Collaborative Exhibition. She has also contributed to the British art scene by participating in a collaborative show in London. Art is by its nature a political act. In this piece, Esra reinforces this by using gold illumination to ‘shed light’ (literally and figuratively) on the Middle East and its people. The background is a collection of news articles in Arabic, some of the stories discuss immigration, the outlook of Muslims in the West and the decline of tourism and reading in the Arab World. 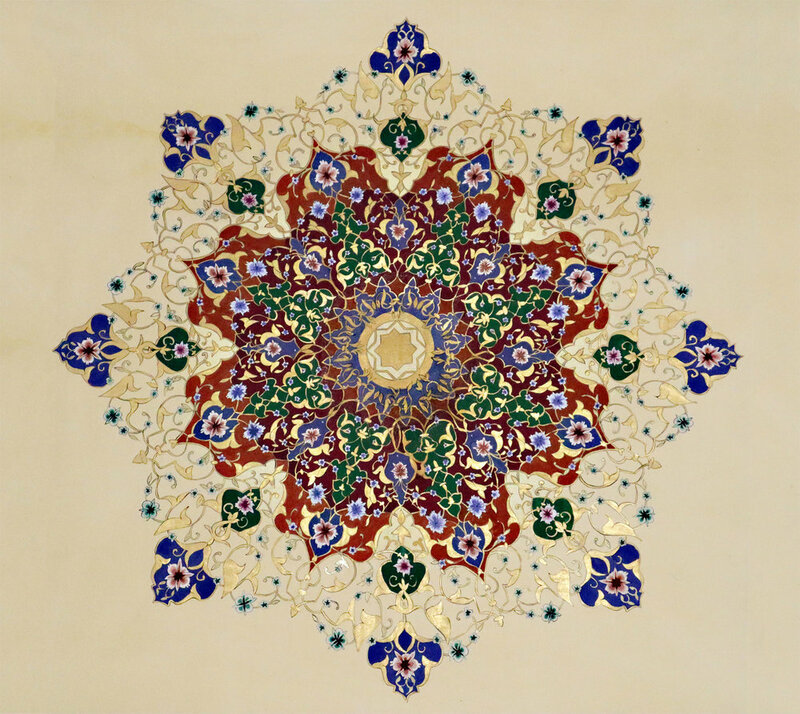 This illumination is inspired by one of the domed ceilings inside the Imami Mosque in Isfahan, Iran. It is a personal interpretation, with flowers and colours inspired by Autumn. This video is a short assortment of clips and details of the daily life of the artist, Esra Alhamal. It seeks to showcase the life of a Muslim female creative. It is a mix of art and travel, the two main interests in the artist’s life. It is about appreciating the little moments that make life big.